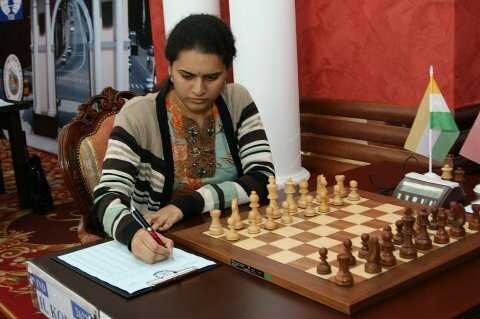 The 4th tournament of the FIDE Women Grand Prix 2011-2012 took place from 9th to 23rd June in Kazan, Russia. 12 top female players competed in the round robin event. The World Championship challenger Humpy Koneru of India and Anna Muzychuk of Slovenia shared the first place with a score of 7.5 points each. They both finished undefeated with four victories and 7 draws. According to the regulations of Grand Prix, in the case of any tie in the tournament, the Grand Prix ranking points and prize money will be split equally. Viktorija Cmilyte, who was joint leader before the final round, and World Champion Hou Yifan, winner of the first two Grand Prix events in Rostov and Shenzhen, shared the third place with 7 points each. Elina Danielian was in the lead after eight rounds, but three consecutive losses in the finish of the tournament left her on 6 points. FIDE Press officer Anastasiya Karlovich reports that Viktorija Cmilyte received a special prize for the 100th anniversary since the birth of Rashit Nezmetdinov. Her victory against Hou Yifan was chosen by the organizing committee as the best game in the tournament. The FIDE Women Grand Prix is a series of elite tournaments which will be organised by FIDE and Global Chess. There will be 6 stages over two years in various countries around the world with three tournaments every year. The winner of each tournament will win 6,500 euros out of a prize fund of 40,000 euros and the overall winner of the series will win a further 15,000 euros at the end of the series.